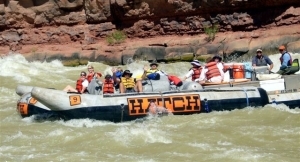 There’s no doubt that a Grand Canyon white water rafting vacation is among the best one can take. But, we’re humbled when we hear from our guests that what really made their trip was coming with Hatch. From being impressed with the company to connecting to our guides, the lovely comments our August and September guests shared with us helped us finish out the season on just the right note. I am 68 and a seasoned traveler. This was the best management of a trip in my life. Dave, Shawn, Chelsea, Travis, Leonard were absolutely fab. They were sooooo!! Great. I will remember each of them for the rest of my life. You have a wonderful staff. The 2016 rafting season is closer than you think! If you’re interested in going rafting next summer, check out our 2016 availability.